Kophai Community residents learned how to grow Pichit limes at home to earn extra money. Community board member Jomnong Tiempool taught the Feb. 18 class on the thorny, thick-skinned lime, one of many varieties available in Thailand, but one of the few that can be grown year-round. Community board member Jomnong Tiempool is teaching Kophai Community residents how to grow Pichit limes at home to earn extra money. 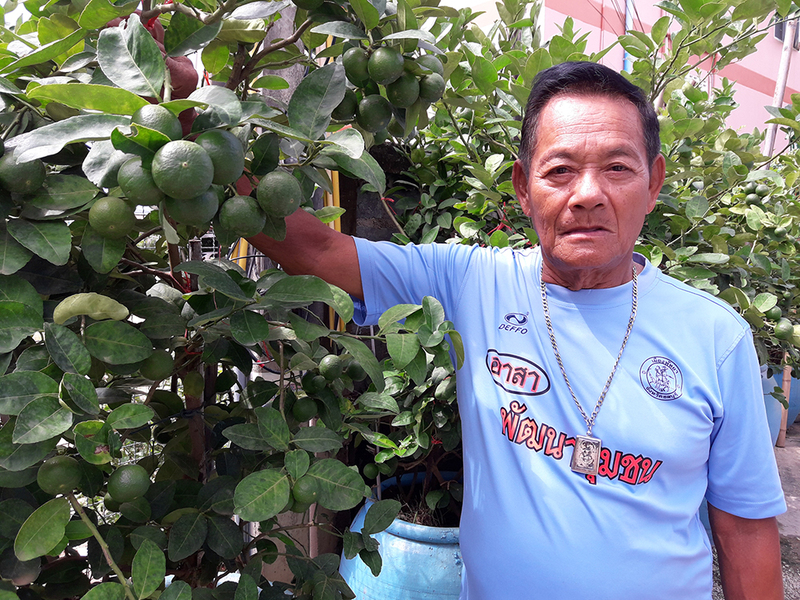 When most limes are out of season, the prices soar to 7-8 baht each, offering those growing Pichit limes a good opportunity to make extra cash, he said. Jomnong showed his students how to graft a lime branch to grow fruit in a jar. He peeled the bark off the branch for several centimeters, and stuck it in a bag of black soil mixed with fertilizer before tying it tightly. Then he will apply water twice a day until it sprouts. He said Pichit limes grow very quickly and require little care. Being grown in a jar will keep it away from bugs. The limes are used in tom yum soup, curries and chili sauce. They won’t sell very well during peak season, as they have thick skins and many seeds, but they’ll be a bumper off-season crop, he said. Anyone interested in learning Jomnong’s technique can contact him at 098-304-0159.